It is not always practical to offer in-house training to barber shop staff and barbering courses and academies can be an expensive alternative. Another option is to invest in a DVD course that will allow trainees to get to grips with the basics. When a barber shop employs a young trainee the first tasks set tend to be the more mundane ones, such as sweeping, tidying up, ensuring towels are clean, greeting customers and perhaps making tea and coffee. The trainee may progress to reception duties, answering the telephone and booking appointments for customers, but it is easy for training to stall at this stage. 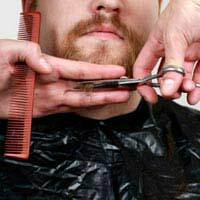 It may suit the barber shop owner to put the next step of the trainee’s training on the backburner, as he will be getting a job done while paying only nominal wages. The problem is that the trainee, left in a state of limbo, is more than likely to become disillusioned with the poor pay, working conditions and lack of progress and leave the profession. The beard trim – Learn how to trim or cut beards, which tools to use and the best way to use them, how to move around the face and how to deal with being in such close proximity to the customer. Long hair – Here the trainee can start to learn some of the basics of scissor-over-comb. The weight line – Understanding this can advance barbering skills to another level. Add an explanation of head shape and a trainee will have a new way of looking at cutting hair. Scissor over comb - One of the most used techniques there is. Master this and it can be used on a daily basis. Texturing - Adding texture to haircuts will open doors when it comes to progressing in barbering. Clipper blending - Using clippers with confidence is not easy, but a DVD can teach a number of techniques and, just as importantly, show what happens when hair is blended incorrectly. Of course, learning from a DVD does not give the trainee the hands-on experience needed, but it can give an understanding of the skills and techniques. The trainee can start gaining hands-on experience by working on hairdressing blocks, which cost less than £50 each and will prevent a raw trainee from ruining their friends’ hair. Some DVD courses demonstrate techniques on such blocks so that the trainee can easily compare results. Once the trainee has perfected skills on hairdressing blocks he can work on family and friends before moving on to paying customers. The feedback the trainee gets from family and friends will be a good indicator of how well he is doing at his new barbering career. @Billy - I'm afraid we can't be seen to recommending particular products , however if you carry out a simple a Google search there are a variety of options you can choose from. I hope this helps. Hello, were can i purchase a barbering teaching dvd from?